Mars is in a spin!! Saros series new 13 south, we now know more about this eclipse. Why you ask? Well let’s look at the current storm in the UK! When you use the 1801 chart, referred to as the, Act of Union of 1801. 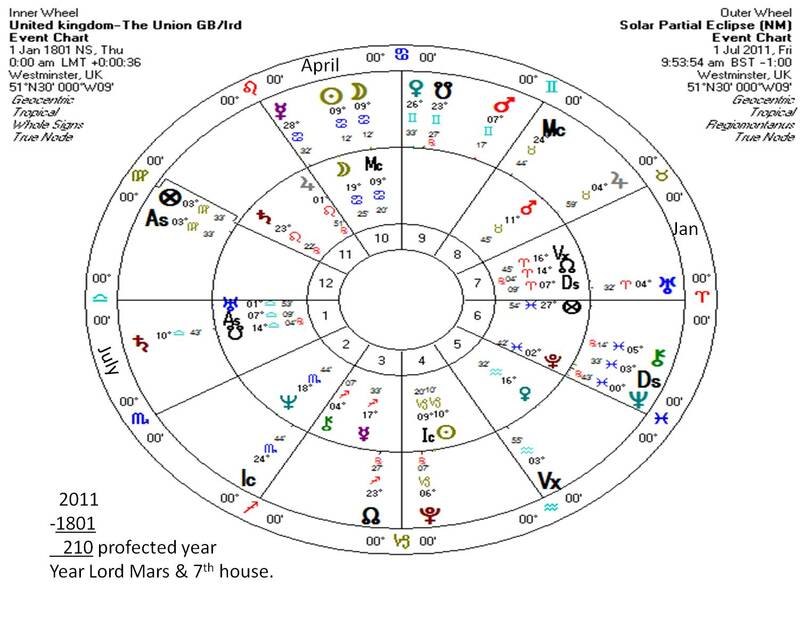 A bi wheel with the Union chart and the July 1st eclipse chart paints a picture that can be decoded. This eclipse fell on the MC of the nation and indirect opposition to the natal Sun. The Sun in the chart is the leader, what’s more, is that eclipse Saturn is in a T-square to the natal Sun and eclipse Sun. Furthermore the Sun rules the 11th house, the Commons. Now natal Saturn is in this house, the 11th and on July 19th when the Murdoch’s fronted the Government committee Mercury was at 23 degrees of Leo, co-joined to the natal Saturn. Mercury’s nature is to contest, contestation. What did the leader/Government know? Now Mars is the 210th profected year Lord and the 7th house is place of activities for the year. Transiting Uranus is in this house. July is the 7th profected Month, using the technique of place derivation houses; the natal first is the 7th month and is where you find transiting Saturn. The full moon of July 15th has Transiting Mars in Gemini in the 9th making a direct trine to natal Venus in the 5th, the house of Lords. Venus is the Month lord of July and is also the lord of natal Mars in the 8th. Ok what’s this telling us??? 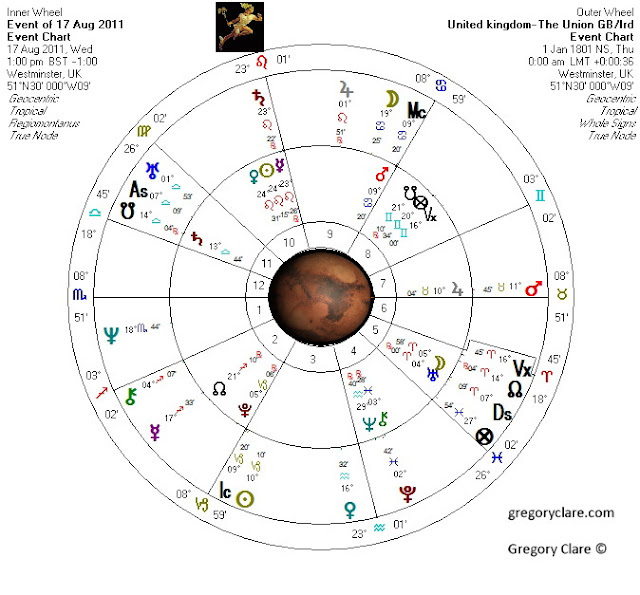 Well here’s the astrological Spin...On August 17th at 1:00pm BST, Mars will reach 9 degrees 20’ of Cancer. This is the degree of the eclipse and the degree of the UK Union MC. What’s uncanny about this is that retrograde Mercury will be at 23 degrees of Leo, co-joined again to the natal Saturn. Furthermore this will happen on the transiting MC and Mars will be on the 9th house cusp!!! What there’s more transiting Jupiter will be co-joined to natal Mars!!! A Sting in the Dragons Tail!!! 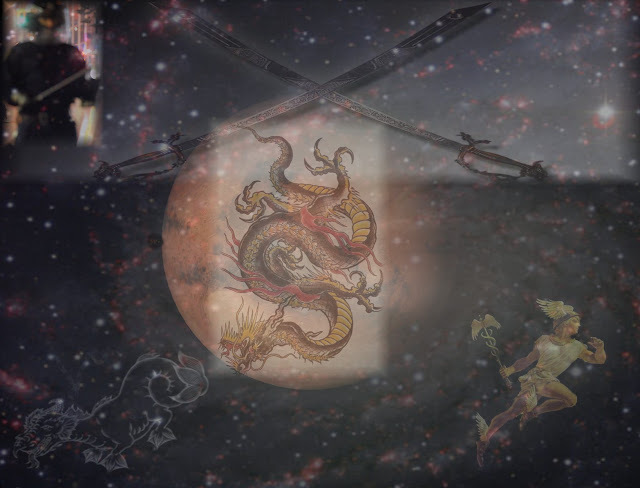 From July 21, 2011 until July 24, be careful of the dragon’s tail! Ares (Mars) is about to attach he’s sword to the dragons tail. Furthermore the swirling, swishing, rustling snake will affect Uranus and Moon. How will the commodities market react to this southern encounter?? The meeting places of the past will be rattled with the sudden and unpredictable actions be aware of the conman...peddling snake oil!!! Those who have been covering or concealing their past robbery will be seen for what they are??? The camouflage will be seen through and hostile attacks may follow...the cloak and dagger screenplay has begun! !